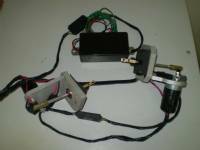 1968-1969 Dodge Charger Electric Headlight Door Actuator Kit. Direct bolt in upgrade kit. 1962-65 Splash Shield, Starter. Sold Each. 1962-65 Strut Splash Shields. Sold as a Pair. 1964 Splash Shields, Front Fender, Top Front. Sold as a Pair. 1964 Splash Shield, Front Fender, Top Rear. Sold as a Pair. 1966-70 Splash Guard Seals with Clips. Sold as a Pair. 1968-70 Inner Fender to Firewall Seals. Sold as a Pair. 1969-70 Road Runner Beep Beep Horn, Long Bracket. Correct Purple Finish & Horn Note. Includes Decal. 1971-74 B-Body Hood Release Cable. Includes Handle, Bracket & Grommet. 1971-74 Road Runner Beep Beep Horn, with Short Bracket. Correct Purple Finish & Horn Note. Includes Decal. Hood Insulation Clips, Fits All Years. Sold as a Set.